So, I’ve never really been a “fall” person. I know, I shouldn’t really say that out loud! I don’t even really like Pumpkin Spice Latte. Yep, there… I said it! Don’t judge me. There is a reason, and it makes perfect sense. I grew up in Miami. And the weather stayed 85 degrees all year round, for the most part. There really is no such thing as fall there—or winter for that matter. Drinking something hot to warm you up wasn’t a thing. This was just something I grew up with. I LOVE hot weather. I’m just that girl. Warm Blooded!!! Time went on, and I landed on the West Coast. Funny thing, here in the OC, we still don’t get fall and winter seasons like most of the country. But the weather shift is slight and a cool breeze does come our way. Just today, it’s actually raining here and the temperature hasn’t gotten above 65 degrees (by the end of the week it will back up to 95) and I’m taking advantage of this. These types of days are best for chilies, stews and baking. But today, I’m thinking soup. Soup is one of those dishes that brings back memories, cures the common cold and is just a bowl of comfort. What I love most about soup is it can be made out of almost everything, appeal to almost anyone and can hit almost every type of flavor. Chowders, Chicken Noodle, Beef and Barley, Split Pea, Broccoli and Cheddar…the list goes on and on. My love for Asian spices tends to come out more during these cooler months for some reason. Pho and Tom Kha soups are two of my favorite to eat this time of year. I could eat them daily! Both very different, but I love the subtle tastes of ginger, cilantro and lime in both. Ahh. Love. I’ve been messing around the kitchen, trying to create something that has that similar flair, but as a veggie option. The great thing is the original version is Vegan, Vegetarian, Paleo and Whole30!!! A soup that will fit the needs of everyone at your dinner table!!! 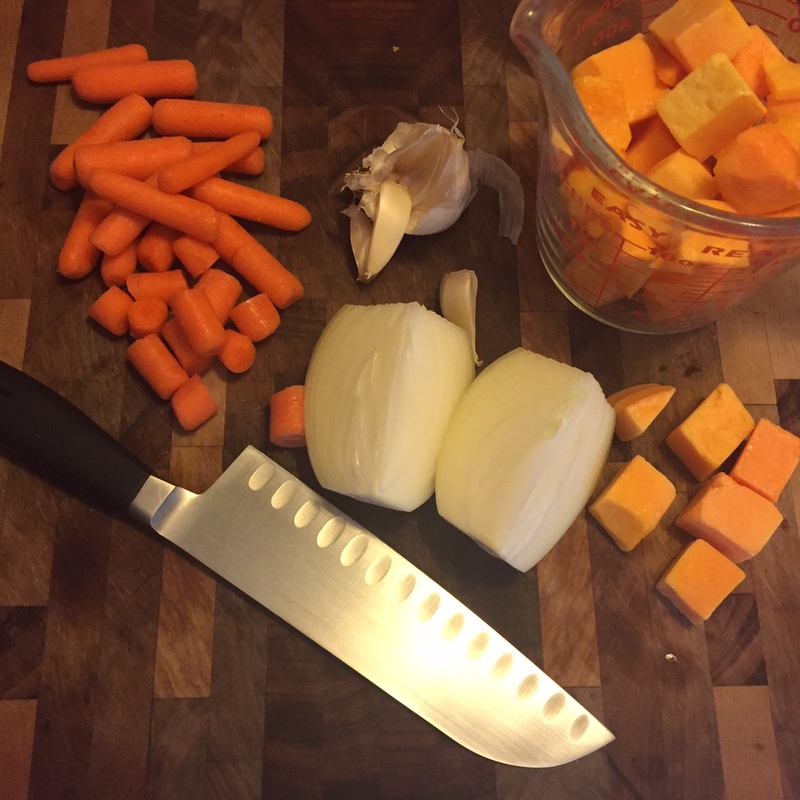 Carrots and Butternut Squash are two fantastic fall veggies, and what better way to appreciate them then to make a soup. 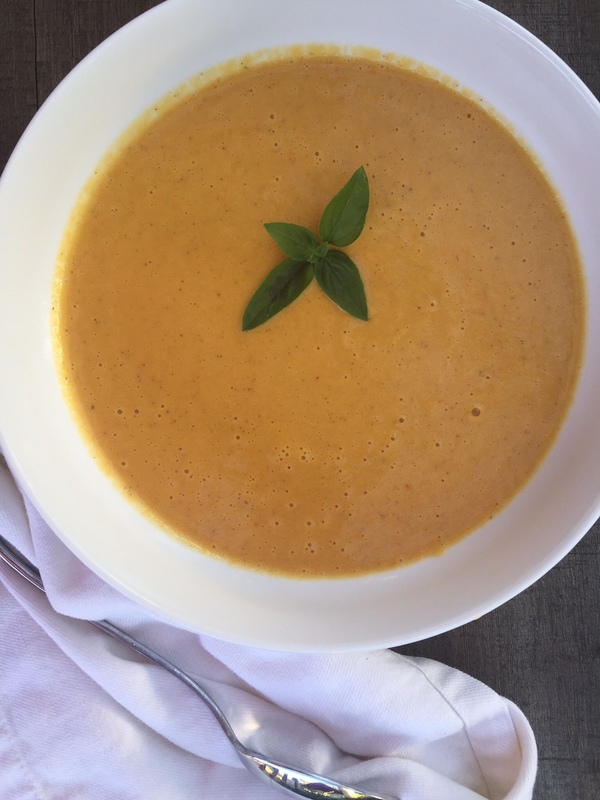 The Coconut Carrot and Butternut Squash Soup below will become your new favorite, I promise! It’s so easy to prepare, a one pot/blender wonder! Ready in about 35 minutes you’ll have love in your bowl!!! What’s great about this soup is that you can take it in so many different directions. You can prepare it as shown, make the texture completely smooth, or have it chunky. Use different types of nut butters. Add different types of toppings. Leave out the coconut milk. The options here are endless. All you need is some imagination, a large pot and a blender and a few ingredients and SOUP IS ON! Dice onion and garlic. (Can leave whole as well. Cook time will be a little longer). Add to pot with 2 Tbsp coconut or olive oil. 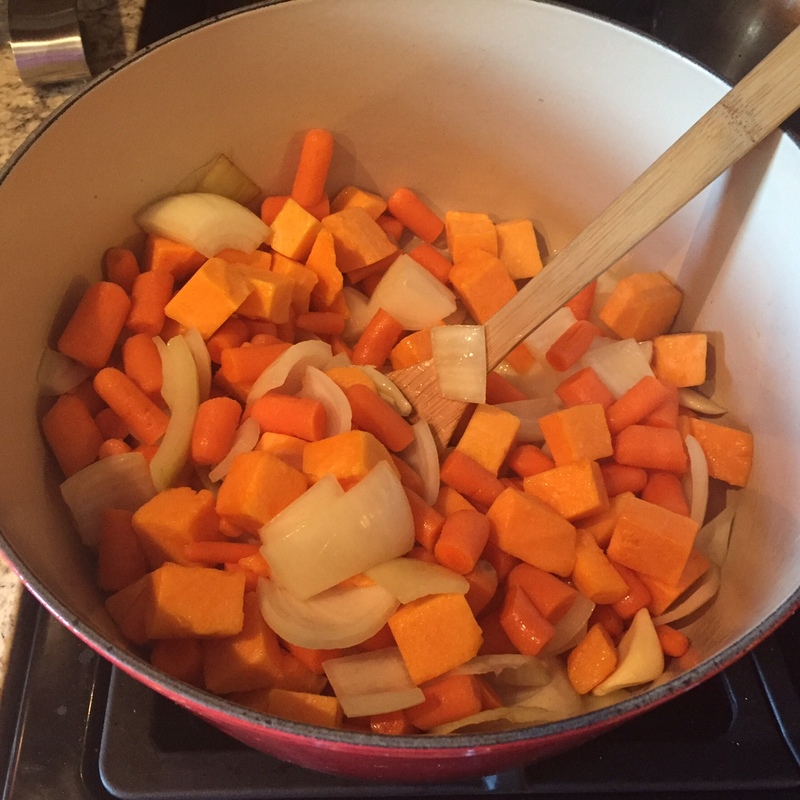 Add carrots and butternut squash and cook for 5 minutes. Season with a each salt and pepper, then add veggie stock and 2 cups of water and stir. Bring to a low boil, then reduce heat to a simmer. Cover and cook for 20 minutes, or until veggies are tender. Add nut butter and chili garlic sauce to the blender and blend to combine. Taste and adjust seasonings as needed. Add ½ can of coconut milk to start. Blend. Add rest for desired taste/texture. Add more chili garlic sauce for more heat. Serve immediately by itself or with desired toppings.